Back in the 1980’s Henk Plancke owned a Bouvier des Flandres named Balder Van Het Lage Land UD AD, who was very successful and was the first AD dog in Australia. In 1986 a new competition commenced – the “Lucky Dog Agility Competition” and Balder won it four years in a row, from 1986 to 1989 inclusive. Balder then retired and to commemorate his prowess in agility the Agility Dog Club decided to present a trophy in his name to the winner of the heats. In 1993 and 1994 there was no Lucky Dog Competition. Friskies had pulled out of sponsorship and the RNSWCC Agility Committee at the time did not persevere with the competition. 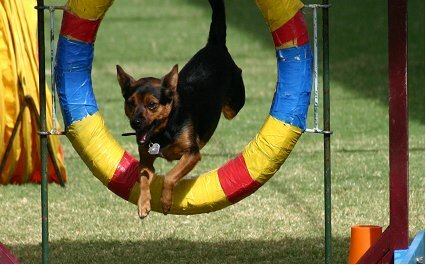 In 1994 the newly elected Agility Committee resurrected the agility competition under the new name of “The Agility Dog of the Year” and the Balder Trophy was again awarded to the winner of the heats.